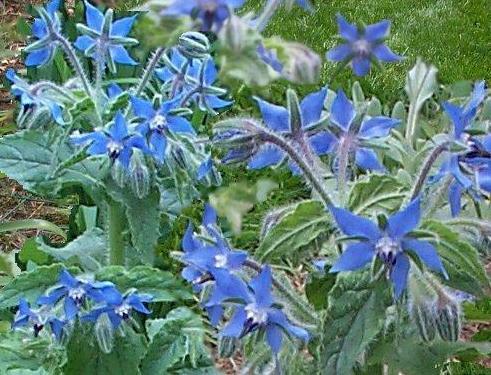 Borage is an upright hairy leaved annual with deep blue flowers hanging in clusters. Both the flowers and the leaves are edible, making it an interesting addition to salads. They both have a faint cucumber flavour and the leaves are best eaten young, before they become too hairy which may irritate some people. Borage is useful in both the vegetable and herb garden as an attractor of bees and is considered a good companion plant for other plants. Borage is an easily grown annual. Seed is sown from spring to early autumn, directly in a fine tilth, in drills 1cm deep, covered, firmed and watered. Plants self seed easily and the seedlings can be transplanted to where they are needed or left. Mature plants can be pulled and added to the compost heap. Pick the leaves when young. The flowers can be picked when fresh, crystallised in sugar syrup and stored for use as cake decorations. Fresh flowers can be frozen in ice cubes.